Sanding is one of those tasks that even a kid would enjoy doing because it is a fan but it does not take much effort. However, when you need to sand a large work area or workpiece, then you may not like it when doing it manually. This is why you will need to find the best palm sander to make the process much easier and get the best results. With right tool, you will have exceptional finishes on the work that you deliver, at the end. 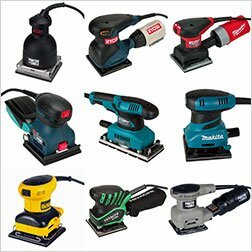 I am happy to inform you that by the end of this article you will have all the information that you will need to be able to pick the right palm sander. Besides the reviews, I will also give you pointers that will help you in making the right decision. The essence of this guide is to help you understand the tool very well and find one that will be able to handle your needs in the best way possible. While this may not appear to be as complicated as the other sanders, you can rest assured that it will deliver quality and smooth surface, ready for varnish application. Please read on to find out more about this tool and how to use it safely. 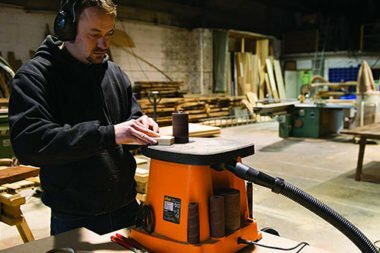 What Is A Palm Sander Used For? Whenever you have to shop for any tool, you need to, first of all, understand its use. The palm sander, which is commonly referred to as a sheet sander is the right tool for sanding a surface, just before painting or applying varnish. This is not as powerful as the other types of sanders like the random orbit sander. However, the tool will be able to give you a smooth surface, with a clean touch and you can easily apply a fresh coat of varnish or paint. This is an essential woodworking tool to have in your toolbox. The tools used ¼ sandpaper of the common 9 by 11 piece as it is not really large. This is the tool to go for when you need to get to the edge of a 90-degree angle. If you want to sand a work surface with several passes, this is the right tool as it moves in a back and forth motion. When you are ready to stain your wood surface, you need the best palm sander and it will give you a surface that is clean and with an aesthetic appeal. You may love the functionality of the palm sanders and be happy to get one. However, when you get to the market, you may be shocked to find that there are tons of models and brands, and each has amazing features. This can be quite confusing and overwhelming as you may not really know which one you should pick for your needs. To make this easier for you, I have tested so many models and picked the best 5 options for you to choose from. I believe that through this best palm sander reviews, you should be able to make a decision and get the right one. Here are my top choices, which you can confidently buy. While the palm sanders seem to be very small, you need to ensure that you have the right one, to give you the expected performance. The DWE6411K 1/4 Sheet Palm Sander Kit is certainly the best palm sander due to a couple of reasons. It comes with a 2.3 amp motor, which is quite powerful as it delivers 14,000 oscillations per minutes. 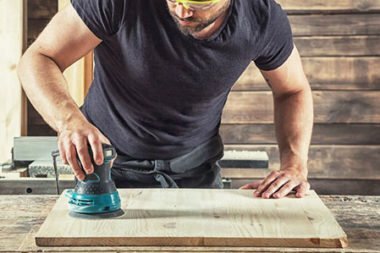 This is convenient for faster sanding and will be able to smoothen your surface and give you a clean touch, to allow you to stain the wood surface and have an appealing look. There is a separate counterweight and this will reduce the vibration when you are using the tool. This is ideal as it minimizes your fatigue and will give you a clean surface that is uniformly sanded. There is a rubber over-mold grip that will provide your great control and comfort to ensure that the sanding is effective. The shorter and compact design is a big plus when it comes to the tool as it will get you closer to the surface that needs sanding. This means that you will be able to maneuver easily over the surface. As far as the dust control goes, there is a locking dust bag that will attach to the model easily and you can secure it with one hand. 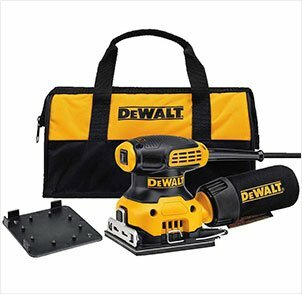 You can use different dust collectors by DEWALT with this sander to be able to effectively contain the dust particles and debris. The paper clamp holds the sandpaper securely when you are sanding. This is clamp is quite improved and this will give you better paper retention. The foam pad is also convenient as it will give you a flatter plane for sanding and this delivers a great result. The model is portable and comes with a carrying bag. One thing that is interesting is the reduced height and compact design of the sander, which gets you closer to the work surface. There are a powerful 2.3 amps motor that has the capacity to sand at speed of 14,000 OPM, for fast and effective results. There rubber dust boot over the switch will protect the tool against dust contamination and ingestion as such, this prolongs the life of the tool. There is a separate counterweight which is meant to reduce the vibration during the sanding process. The locking dust port is a system that allows you to connect the tool to the dust bag using a single hand and is quite effective. There are some things that should be top on your mind when you go out shopping for a palm sander. 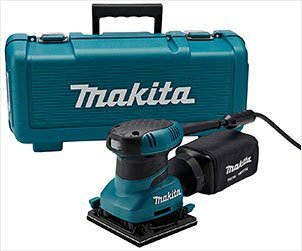 Precision and accuracy are top on the list and fortunately, the Makita BO4556K is the right tool as it is quite innovative and has all these features that you would need to get the right results. This is a convenient tool that has been made to give both professional woodworkers and DIY a smooth and clean surface, without much difficulty. This has been rated as the right solution for sanding wood surfaces for staining. With a 2 amp motor that will deliver 14,000 OPM, this is the best palm sander for wood. You will be able to remove stock quite fast and be left with a very smooth surface, which is not damaged. Precision is a key concern for most contractors and this particular model is designed with an all ball bearing construction that will reduce the vibration and the noise levels significantly. There is a very large clamping lever, which makes the process of clamping and paper installation easier, saving you downtimes and increasing productivity levels. The ergonomic design of the tool is another feature that is worth mentioning. It comes with a contoured and rubberized palm grip and as such, it will fit perfectly, into your palm like a glove. This means that you will have the right control to get the desired results. The rubber sealed switch is essential as it prevents dust contamination, which extends the life of the tool by increasing its durability. There is a through the pad dust collection system that is essential in that it will provide a cleaner work area at all times. You will get a fabric dust bag that has a wider mouth for easier disposal of the dust. This model comes with a rubber sealed switch that will prevent and reduce dust ingestion, thereby increasing the efficiency of the tool and extending its lifespan. The palm sander has a 2amp motor that delivers 14,000 OPM that will give you a fast and smooth sanding. The tool has an all bearing construction, which is meant to reduce noise and vibration and as such, precision is enhanced. The large clamping lever is also useful as it will make the process of installing and removing the sandpapers much easier. The ergonomic design and contoured rubberized palm grip will give you improved comfort and control when sanding. The beauty of the SKIL 7292-02 is the fact that it delivers faster stock removal and has a great result at the end of the process. This ¼ sheet palm sander has a number of amazing features that you will certainly be in love with. It is one of those tools that you need to have when it comes to the finish of projects that you are working on. If you are just about to stain your wood, then you may want to consider sanding it with this machine and you will love the professional results that you will get. There is a pressure control indicator which will allow you to know the right amount of pressure to apply. In the event that there is too much pressure applied, then you will get a warning and this is a great way to prevent any cases of overloading the tool. The pad brake is critical for the end results that you need. This will stop the sander on time when you finish working on it and as such, there will be no chances of gouging. The tool comes with a dust sealed switch, which prevents any dust contamination and this will prolong the useful life of the tool. As for the dust control, there is an effective dust control mechanism that has micro-filtration and as such, even the finest dust particles will be captured and contained. The dust canister is clear and as such, you do not need to keep opening it to tell when you need to empty it as you can clearly see it. The built-in vacuum adapter is also useful as it gives you maximum dust collection. There is a soft grip design which is added for your comfort and effective control. You will have the best results at the end of it all. The SKIL 7292-02 used a pressure control technology which will show you the right amount of pressure to apply and warn you when there is too much pressure applied. The dust-sealed switch is essential as it will prevent dust ingestion and this works to promote the durability of the tool. There is a clear dust canister that has been included in this model and as such, you will easily be able to know when to empty it, when it is full. The soft grip design of this sander gives you the best control and enhances your comfort while at it. The dust collection system is quite effective as it has microfiltration, which will capture and contain fine dust particles and debris. 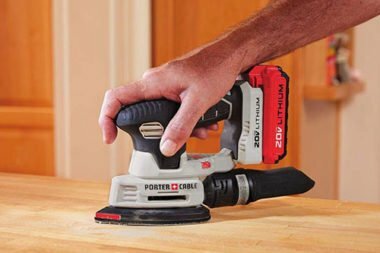 Equipped with a 2.0 AMP motor, the PORTER-CABLE 380 1/4 Sheet Orbital Finish Sander is the best palm sander as it is able to move at 13,500 OPM. As such, when you need faster stock removal with a superior finish, this is the right tool that you can use. This comes as a 4-pack kit and carries everything that you would need to be able to sand your wooden surfaces in preparation for painting or varnish application. Their dual plane is another feature which is essential as it will deliver counter balance, which reduces vibration. The dust-sealed switch will protect the tool from ingesting dust or being contaminated by debris. This means that the tool will have an exceptional performance at all times and this goes a long way to promote longer life. As for precision, you have nothing to worry about as the sander has an all bearing sealed construction, which is an assurance of utmost precision and a smooth finish. You will be able to use the tool for less aggressive sanding and you can be sure that you will have a great finish. The lightweight and compact design work for your advantage as well as this make the tool to be quite portable. In addition, the reduced height brings you closer to the work surface and ultimately, this will give you the control that you need to deliver the right results. When you choose to buy this model, you will get an operating manual as well as a paper punch so as to make it easier for you to use it. The overall design will reduce your fatigue and as such, you can work for extended periods without getting fatigued. 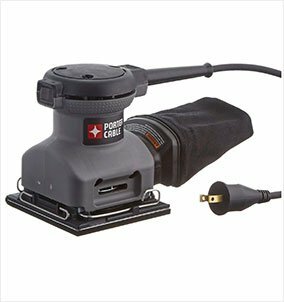 The PORTER-CABLE 380 1/4 Sheet Orbital Finish Sander is precision engineered as it comes with 100% all-bearing construction. 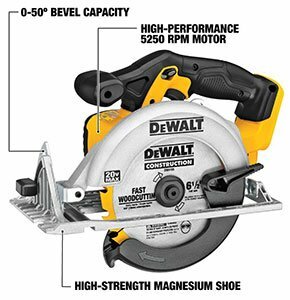 This is powered by a 2.0 AMP motor that is capable of moving at speeds of up to 13,500 OPM and this removes stock faster and delivers a superior finish. The dual plane and counter balance design ensure that the vibration is significantly reduced and this will reduce fatigue. There is a dust sealed switch that will prevent any dust contamination and this is going to promote a longer life of the switch and the tool. The compact design and the reduced height will be closer to the work surface so you can have control and deliver excellent finish. The BLACK+DECKER BDEQS300 1/4-sheet orbital sander is the best orbital palm sander as it comes with paddle switch for activation that will make it easier for easy on and off during application. This paddle switch is conveniently located on top of the sander for easier access. It comes with a 2.0 Amp motor that has 1,600 IOPM and this is sufficient speed to remove material and leave you with a smooth surface. The compact size works with the ergonomic design to ensure that you can get to very tight spaces and make the most of the sander. When you need to activate the paddle switch, all you need to do is press it down with your palm as if you are using the sander. You can easily lock the tool into on or off position conveniently with the use of a single hand. The dust collection system is quite effective and will see to it that you have a clean work surface at all times. The sander has been designed in such a way that it will deliver high performance and give you a superior finish on your surface. 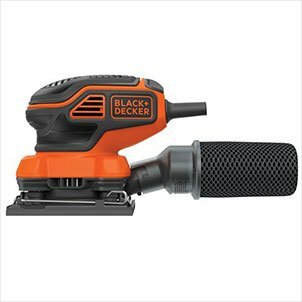 The BLACK+DECKER BDEQS300 1/4-sheet orbital sander is quite versatile and it is a tool that both experts and novices will love to a great extent. The process of material removal is quite fast and the tool ensures that the workpiece is not damaged at all. The combination of amazing features and the ergonomic design is one of the reasons why most people find the tool to be convenient and useful in their sanding works. Please note that this is ideal for less aggressive sanding and will be useful when you need to smoothen surfaces that need to be painted. The BLACK+DECKER BDEQS300 1/4-sheet orbital sander offers a 270-degree flush sanding, which will give you adequate clearance. The tri-later filtration will ensure that all the fine dust particles are captured and contained in the best way possible, giving you a clean work area. The paddle switch is part of the useful features of this tool and as such, it will give you easy on and off activation during application. The sander has a 2.0 amp motor which is able to provide efficient material removal at 1,600 OPM. The high-performance dust collection system and the soft grip paddle switch are some of the features that make this tool become so popular on the market. 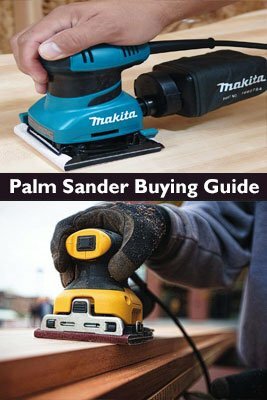 How Do You Pick The Right Palm Sander? If you need to maximize productivity, then you may want to go for a model that has an easy mechanism for changing paper. This means that you do not have to stop for a very long time to change the paper. Replacing sandpapers needs to be easy and this is what you will need to consider in your shopping process. Go for a model that requires no tools to be able to change the paper and this will save you a lot of time. The power of any tool is what defines the performance thereof. When you have a tool that has a bigger motor, this means that it can easily handle huge tasks. 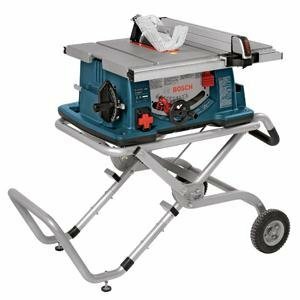 However, when it comes to the palm sander, you may not necessarily need to have a powerful motor, instead, go for one that has a smooth operation. With the right pressure applied, you should be able to get the work done, without the need for too much power. The focus of performance more than the power, as this is a tool for light sanding. You need to consider the design of your tool and as such, you may want to pay attention to the ergonomics. You can check the counter balance system as this is known to reduce the vibration significantly and improve the results. Finding one with an all bearing construction is also useful as it will enhance the precision that you will get. You need to pick a model with a dust sealed switch as this prolongs the useful life of the tool. Go for a design that offers you comfort and convenience for sanding. Having a tool with a proper dust collection system is also another essential factor. This will prevent you from inhaling too much dust from the sanding process. You can choose a model that has a dust collection system that will be able to go through the pad and into the dust canister. The advanced models come with several layers of filtration and as such even the finest dust particles can be contained and this protects your tool and your health. You will want to also put the issue of price into consideration as well. This will help you make the right decision, and not affect your finances. The secret is to pick a number of models that are within the same price range and compare them. You comparison needs to be influenced by the specific needs that you have as this will make you pick the tool with the right features, within your budget. Before attempting anything, you need to go through the manual that has been provided by the manufacturer. When you are not using your sander, you should ensure that it is unplugged from power. During the sanding process, you should always protect your eyes from the dust particles by using safety goggles and a dust mask. You should apply gentle pressure on the sander as you are using so as to avoid overloading it and making mistakes. Make sure that the surface that is being sanded is properly secured. Never make any adjustments or change the paper when the sander is still running. You should switch it off and unplug it from the power source. Q: Can I attach a standard vacuum hose to the palm sander? A: Due to its nature and small size, palm sanders lack an option to attach a palm sander. However, they come with a dust collection system that is effective in containing the dust. Q: Is this the right tool for kitchen cabinet renovations? A: This will depend on the scope of the work as this uses a ¼ sheet and may only help you when it comes to corners and tight spaces. Q: Can use the self-adhesive sandpaper with the palm sander? A: In most cases, the palm sander have a rubber pad and as such, the paper will stick and peel easily. When using the self-adhesive, you need to careful when sanding the edges. 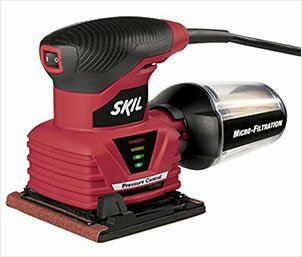 Q: Does the palm sander work on other application or is it for wood only? A: Ideally, this will only work effectively when it comes to woodwork because it is not meant for aggressive sanding. 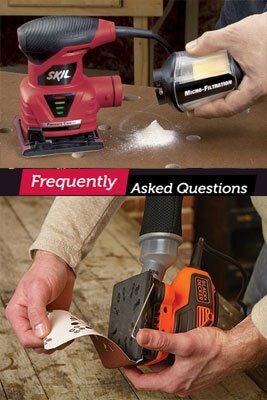 For heavy duty sanding, you may need to find another type of sander. Q: Will the sandpaper come with the holes for easier working? A: Yes, the sandpaper comes with holes that are usually lined up with a punch plate. The dust will actually go through these holes into the dust bag. The biggest advantage of being able to get a palm sander is the fact that you will be able to make the sanding process easier. It is important to note that this is the ideal tool for the final finish, just before staining wood. There are many models and my objective of putting together this guide is to help you make the right decision. The top 5 models of palm sanders that I have reviewed come with the leading features. They would be a good choice to consider. I recommend the BLACK+DECKER BDEQS300 1/4-sheet orbital sander as the best palm sander. This is a tool that is versatile and has quite a number of convenient features. If you have any concerns, questions or suggestions, please leave a comment below. I also encourage you to share this guide far and wide.